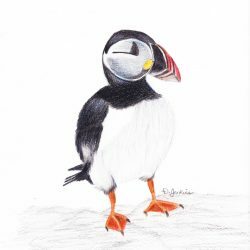 The Atlantic puffin (Fratercula arctica) is the official provincial bird of Newfoundland and Labrador. Often referred to as “sea parrots”, Atlantic puffins can be found on islands and shorelines on both sides of the Atlantic ocean. The largest colony of Atlantic puffins in the western Atlantic can be found right here in Newfoundland at the Witless Bay Ecological Reserve.